This is the greatest recipe! On a cold day, this will warm you up fast (and possibly clear out your nasal passages at the same time). 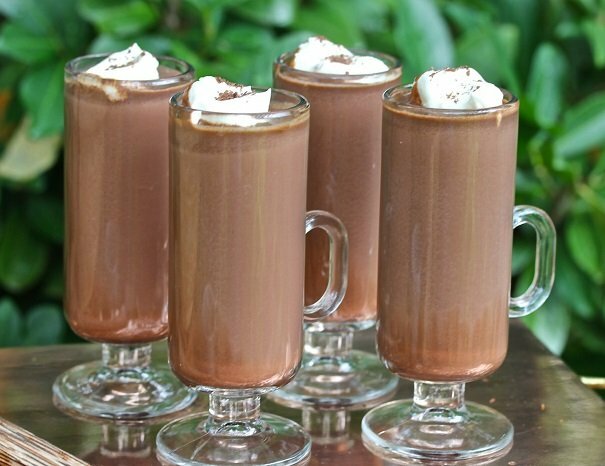 Though this hot chocolate is non-alcoholic, it almost tastes like an adult drink, the flavors are so complex, but kids will love the bang of the cayenne mixed with the sweetness of the chocolate. Heat milk in a medium-sized saucepan at medium heat. Do not allow milk to scald or boil. Mix in cocoa powder, spices, sugar and chocolate chips. Using a whisk, whisk the mixture until frothy. Serve hot, topped with whipped cream and sprinkle with shaved chocolate.